Profiling the transcriptomes of individual cells with single-cell RNA sequencing (scRNA-seq) has been widely applied to provide a detailed molecular characterization of cellular heterogeneity within a population of cells. Despite recent technological advances of scRNA-seq, technical variability of gene expression in scRNA-seq is still much higher than that in bulk RNA-seq. Accounting for technical variability is therefore a prerequisite for correctly analyzing single-cell data. 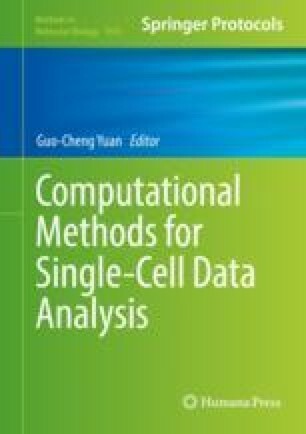 This chapter describes a computational pipeline for detecting highly variable genes exhibiting higher cell-to-cell variability than expected by technical noise. The basic pipeline using the scater and scran R/Bioconductor packages includes deconvolution-based normalization, fitting the mean-variance trend, testing for nonzero biological variability, and visualization with highly variable genes. An outline of the underlying theory of detecting highly variable genes is also presented. We illustrate how the pipeline works by using two case studies, one from mouse embryonic stem cells with external RNA spike-ins, and the other from mouse dentate gyrus cells without spike-ins. Beomseok Kim and Eunmin Lee contributed equally to this work. This work was supported by the National Research Foundation of Korea funded by the Ministry of Science, ICT and Future Planning (2017R1C1B2007843, 2017M3C7A1048448, 2017M3A9B6073099, 2017M3A9D5A01052447), and by Business for Cooperative R&D between Industry, Academy, and Research Institute funded by the Ministry of SMEs and Startups (C0452791).